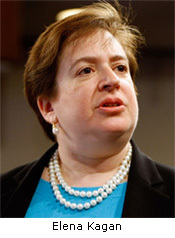 Washington, DC – Earlier this week, the Clinton Library released a number of memos related to Supreme Court nominee Elena Kagan. The most discussed memo, dated January, 1997, concerns her take on the necessity of partial birth abortions and her input by adding language to a statement issued by the American College of Obstetricians and Gynecologists (ACOG) that favored the now-illegal late-term abortion method. Kagan does not include a written statement from PHACT and only quotes from that organization in part. In contrast to her dismissive attitude toward PHACT, Kagan not only includes a full, two-page statement issued by PRCH on their letterhead, but highlights portions of that statement that agreed with the position in support of partial birth abortion that she advocated. The Society of Physicians for Reproductive Choice is without a doubt the most extreme organization of abortionists in the nation. It is a group of abortionists who proudly boast of having committed illegal abortions prior to Roe v. Wade and advocate for no restrictions on abortion at all – ever. These back-alley abortionists violated the law, some for years, committing thousands of illegal abortions. Who knows how many women were maimed or even killed by them. They were never held accountable for their crimes after the issuance of the Roe v. Wade Supreme Court decision in 1973. Among those PRCH abortionists are Curtis Boyd, who now operates the largest late-term abortion mill in the free world in Albuquerque, New Mexico, were there are virtually no laws restricting abortions through the 9th month of pregnancy. Women travel to Albuquerque from all over the country to obtain late-term abortions that are illegal in their home states. Radical? Extreme? That is only the tip of the iceberg. The PRCH recently published a list of so-called “Abortion Providers Declaration of Rights” that details their fanatical abortion philosophy. According to this statement, in their perfect world there would be no abortion laws whatsoever, every physician would be forced to receive abortion training, and pro-life First Amendment speech against abortion would be silenced. In other words, the PRCH wants abortionist to have the right to conduct human experimentation on their unwitting abortion patients in order to develop new ways to dismember, poison, or otherwise kill innocent pre-born babies, many which are viable and healthy. One of their members, Curtis Boyd has already admitted he has done so much in his development of new ways to kill babies in the second trimester of pregnancy. It simply doesn’t get any more extreme than that. Yet, this is a group that Kagan has taken cues from in the past. The same basic philosophy promoted in the 1997 PRCH memo made its way into the policy statement of ACOG, thanks to recommendations made by Kagan in her own handwriting. The 1997 ACOG statement, with the PRCH inspired Kagan additions, helped defeat the Federal ban on partial birth abortions that year and prolonged the use of this grisly brain-sucking technique an additional six years until the Partial Birth Abortion Ban Act of 2003 was finally passed and signed into law.